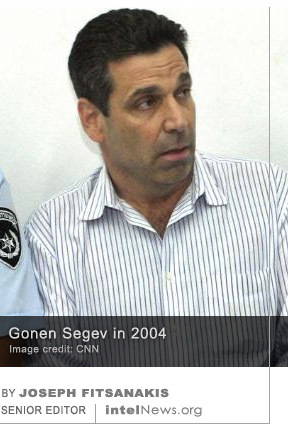 Israel has charged Gonen Segev, who served as the Jewish state’s Minister of Energy and Infrastructure, with spying for its archenemy, Iran. Segev, 62, was reportedly detained last month during a trip to Equatorial Guinea following a request by Israeli officials. He was then extradited to Israel and arrested as soon as he arrived in Tel Aviv last month, according to a statement by the Shin Bet, Israel’s domestic security service. On Monday it emerged that Israeli authorities had imposed a gag order on the case, forbidding Israeli media from reporting any information about it. The order appears to have now been lifted. In 1992, when he was 35, Segev was elected as one of the Knesset’s youngest members, representing the conservative Tzomet party. Initially an opposition Knesset member, Segev eventually left Tzomet and joined a governing coalition with the Labor Party, in which he served as Minister of Energy and Infrastructure. After exiting politics, Segev, who is a medical doctor by training, became a businessman and traveled frequently abroad. But in 2004 he was arrested on a flight from Holland, while reportedly trying to smuggle several thousand ecstasy pills into Israel. He was jailed for five years but was released from prison in 2007, after a commendation for good conduct. Shortly after his release, Segev moved to the Nigerian city of Abuja, where he practiced medicine. It was there, the Shin Bet claims, that he was recruited by Iranian intelligence. In a statement released on Monday, the Shin Bet said that Segev had admitted being in regular contact with Iranian intelligence agents in Nigeria and other countries around the world. He is reported to have said that he was given a fake passport by his handlers, which he used to visit Iran on two separate occasions in order to hold secret meetings with Iranian intelligence officers. He also traveled to several other countries in order to meet with his Iranian handlers and hand them information about Israel’s energy sector and the location of energy-related security sites in the country. The Shin Bet statement added that Segev introduced his Iranian handlers —who posed as foreign businessmen— to Israeli security officials on several occasions. It is believed that Segev appeared before a court in Jerusalem on Friday. He was charged with “assisting an enemy in wartime” and with “carrying out espionage against the State of Israel”. The judge also charged him with numerous instances of transmitting classified information to a foreign power. German authorities have charged a Tunisian citizen with building a biological weapon, after finding significant quantities of the highly toxic substance ricin in his apartment. The 29-year-old man is referred to in public reports only as “Sief Allah H.”, in compliance with German law that forbids the naming of suspects until they are found guilty in court. German officials said last Thursday that the man remains in custody and has been charged with violating Germany’s War Weapons Control Act (known as Kriegswaffenkontrollgesetz) and “preparing a serious act of violence against the state”. According to reports, German intelligence services received a tip-off last month that the man had made online purchases of a coffee grinder and 1,000 castor seeds. Processing castor seeds creates a ricin byproduct, which can then be weaponized in the form of a powder, a fine mist, or solid pellets of various sizes. The end product is more powerful than many other toxic substances, such as cyanide. Upon entering the human body, ricin can cause multiple organ failure in less than two days. It has no known antidote. After receiving the tip-off, German authorities began monitoring the suspect’s movements in the western German city of Cologne, near the Belgian and Dutch borders. By June, German police discovered that he had produced enough ricin to dispense as many as 1,000 lethal doses. German media reported that “Sief Allah H.” is a sympathizer of the Islamic State. However, investigators have found no direct link between him and any militant organizations in Germany or abroad. Additionally, no evidence has yet been presented that he had planned an actual attack —in Germany or elsewhere— at a specific time. However, officials from Germany’s Federal Office for the Protection of the Constitution said it was “very likely” that the arrest of “Sief Allah H.” had averted a terrorist attack. Late last week, German newsmagazine Der Spiegel said that the suspect had made ricin by following instructions posted online by the Islamic State. Throughout the weekend, several other apartments in Cologne were searched by German authorities. Search parties consisted of members of the local police, intelligence officers and scientists from the Robert Koch Institute, the German government agency tasked with monitoring hazards to public health.